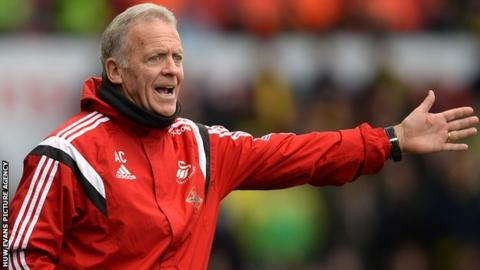 Swansea City's players are playing for their futures as well as the club's Premier League survival, according to assistant coach Alan Curtis. The Swans are 10 points clear of the relegation zone with six games left of what has been a testing campaign. With safety not yet guaranteed, Curtis believes there is much riding on Saturday's home match against reigning champions Chelsea. "It goes hand in hand, that players are playing for their future," said Curtis. "But the most important thing is the club stays in the Premier League." Curtis was placed in temporary charge of Swansea following the sacking of former manager Garry Monk in December. The former Swans and Wales forward has remained part of the club's coaching staff following the appointment of Francesco Guidolin as head coach in January. With 37 points from their 32 league games this season, Swansea are all but assured of their place in the Premier League for the next term. Curtis wants a strong end to the campaign as the Welsh side aim to preserve their top-flight status. "We've worked so hard and this is coming up to the tail-end of our fifth season," he added. "We want to stay there, not only for next season but for the seasons to come."